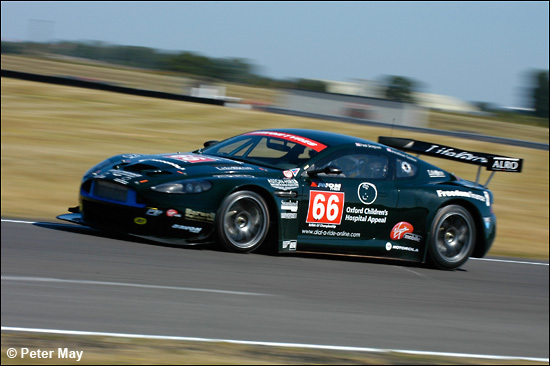 The Barwell Aston Martins fitted in 2006 British GT events around its FIA GT3 programme – but still came away with a GT3 title for Leo Machitski (with a little help from a Porsche). The 2007 Avon Tyres British GT Championship will see a full-season campaign from at least the Paul Drayson-owned DBRS9: his co-driver is yet to be confirmed. Barwell Motorsport is in negotiations to run a second car, for a part season or full season. Paul Drayson – proper title Lord Drayson – is a Defence Procurement Minister for Her Majesty’s Government. He and Jonathan Cocker finished fourth and then second in GT3 in the two races at a parched Snetterton in mid-July this year (below).